Photographs shows Left to right: Mike Glennon, Fergus Ewing MSP and Pat Glennon. 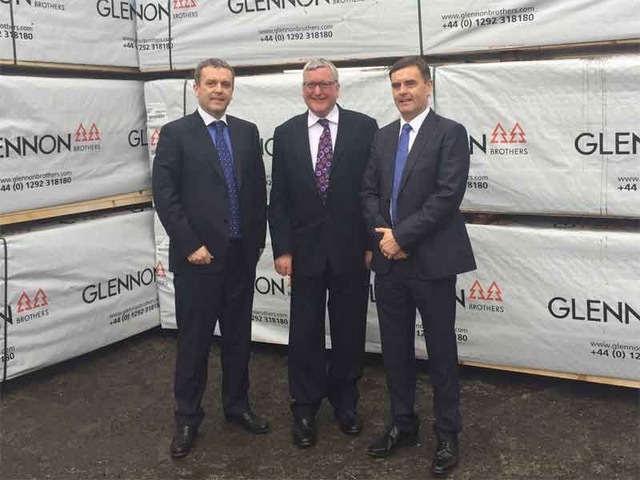 Leading timber processing firm, Glennon Brothers welcomed Mr. Fergus Ewing, MSP for Inverness & Nairn, and Cabinet Secretary for the Rural Economy and Connectivity, to its plant in the port of Troon (formerly Adam Wilson & Sons), on Thursday March 30th 2017. During the visit, Mr. Ewing met with Joint Managing Directors, Pat and Mike Glennon, and saw first-hand the ongoing construction of the £14 million investment in a combined heat and power (CHP) biomass facility. The visit aimed to highlight the importance of the sawmilling sector to the Scottish economy, and afforded the Cabinet Secretary the opportunity to engage with Glennon Brothers, on the key issues facing the sawmilling and wider forest products sector. Glennon Brothers’ story commenced with the acquisition of an old flax mill in Longford by brothers William and James Glennon in 1913. It was on this property that the brothers set up the first ‘Glennons’ sawmill. While James returned to the USA, William continued to run the business until the mid 1940s when he was succeeded by his son Patrick (Paddy). Over time, the business evolved from sawing hardwoods for a range of indigenous uses to today’s highly sophisticated softwood operation. Paddy was responsible for the growth and development of the business for over 50 years. Paddy’s sons, Pat and Mike, became joint managing directors in the mid 1990s. They drove the growth of the company with the acquisition of the Fermoy plant from the Smurfit group in 1998, and the subsequent €25 million capital development plan to transform the loss making plant into a state of the art timber processing operation. They have subsequently expanded the group through the acquisition of Windymains Timber (2005) near Edinburgh, Dempsey Timber Engineering (2007) in Arklow and Adam Wilsons and Alexanders Timber Design (2008) in Scotland. Windymains Timber located in Humbie, near Edinburgh, is a specialist fencing and treated timber mill with an annual production capacity of 50,000m3. Adam Wilsons is a fifth generation family business, located in the port of Troon, and is one of the largest sawmills in the UK, employing over 100 people. Wilsons specialises in kiln dried carcassing, fencing, pallet and packaging material. The group total sawn wood capacity is now 450,000m3 per annum and it has a kiln drying capacity of 220,000m3 per annum. Alexanders Timber Design is a leading provider of quality timber frames and engineered roof trusses in the UK, supplying both timber frame homes and commercial properties. Dempsey Timber Engineering specialise in the supply and installation of Timber Frame Homes and Engineered Roof Trusses to the construction industry and also to one off self builders.